Honestly, I am so confused to start this story. It took place when I was working on my final project. I had a two-day trip to call it a day for a new sensation. I was so tired of it all. I had called my girl partner in Surabaya and asked her to accompany me. After the last attending of my family’s wedding on 2005, I had wondered how the city would be. I had just wanna walk down the street. Very depressed, had no idea what I wanted to do. On 9 am, I had arrrived on Gubeng Station. Waiting for my partner to pick me up, I was left playing my phone by myself and started to take a new picture. I still remember, it was Nokia Xpress Music. There was nothing else to buy a new smartphone. Far cry from my college,they have had of it. Oh, how a really poor boy I was. A few minutes later, my partner in crime was standing beside me. If only I had time to stand within a long time, I didn’t expect she would be shocked. I’d have become a charred zombie. Surabaya was so hot that day. Oh yes, those was my first solo trip to outside. I asked her to bring me to go to a cozy place. Realizing I had a bad problem, she gave me a good spirit. We we’d have gone to a coziest place : Tunjungan Plaza. Haha, I am still taking fun of it. Why? I always get a new notification when I have an appointment : See you on the lower ground of TP (Tunjungan plaza). Oh damn. But, on this story, It was the first time I saw the biggest shopping market on this capital province. Proud of me. We were no job. As people say “Kids jaman now”, we did nothing. After we had finished “tawaf” and grabbed a bite, my partner asked me to get out from this area. I guess, she wanted to have lunch but no more money to do it. Oh on this memory, I wished to complete my final project soon and got a new job to reach gold, gospel, and glory. 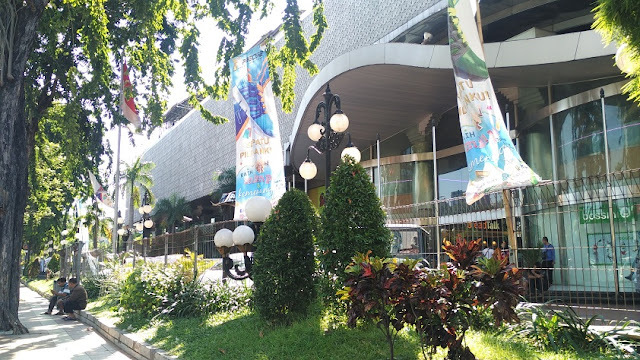 We decided to go to ITC Surabaya, just a walk from Surabaya Kota Station. We enjoyed the best luch ever. Just a few thousands rupiahs, we were out trying some local food, eating special “Lontong Balap” and many kinds of juice. Oh so yummy. Let’s think. How much cost should I spent on having luxury lunch at TP? Oh no, why did time go faster? When I saw my phone, it was 3 pm. My partner took me on the station. I had to print the boarding pass before 4.15. Luckily, there was no more distance to obtain a boarding pass and make a smile with a security. I thanked to my partner after he had completed his job. What a nice girl she was! Hehe. I had waited for a long time. Actually, it was 4.20. I heard a softly sound from a megaphone. It reminded me of paying attention the departure of my train. Official said that my train was on the track. But, floods in Lapindo had inundated a long stretch of rail tracks along Jl. Raya Porong. The train trip was postpone for a several minutes. The rain had fallen. A few moments later, the official announced a softly notice again. I didn’t hear it clearly. He said that the train will be departed soon. Actually, there was two local train on the track. On of them was still waiting for its departure time. But, I believed it was my train that announced by the official. I was coming in and checked my desk number. I sat down in front of a middle age man. He was hitting the sack with his head relying on the dewy window. The train passed Surabaya Kota and went to Surabaya Gubeng and Wonokromo. On the last of it, suddenly, there were two of girls that wanted to sit on my board. They checked their ticket and made a sure of it. Hearing a noise, the man was awakened and asked me where I wanted to go. Be in a hot water, I explained my final destination to him. He claimed that I had ridden a wrong train. I should took The Penataran-Dhoho, but unfortunately, I had came in The Dhoho-Penataran, the reverse of my route. Oh God, what should I do? This train was on the long trip to Mojokereto-Jombang-Kediri. Indeed, the last station of it was Malang Kotabaru which would have arrived on 10.10 pm. Cry over spilt milk, I was most dumning in my silliness. Several moments later, a Polsuska, the guard on the train who was standing on the door looked on my face. Oh no, he’d killed me. If I had my druthers, I wanted to jumpt out. But, I realized that I was not playing with a full deck. He walked towards me and asked what’s of my problem. I tried to tell my folish. Oh, I couldn’t imagine what he did. But, nothing else had happen. He just gave me a wise conclution. I had to get off in the following station, Sepanjang. It is located on Taman Subdistric, Sidoarjo. Actually, I felt he really wanted to kick me out after I had seen by him. How a poor criminals I was. The train had stopped while the rain was falling. I outrun far away and made a sure that I could reach the station as soon as possible. I reached the desk in that small station within wet clothes. I became a cat who just spilled in a well. All the better, I found the best choice to solve my problem. I required at least 20.000 rupiahs to get me on my bed tonight. I I had to go to Bungurasih and got the last bus. 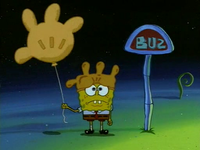 Oh Spongebob, I knew your flutter while you were getting lost in the Rock Bottom. But, I didn’t it because I was broke. Actually, there was 10.000 rupiahs on my wallet. I was, by no means, spent no more cost by riding a train. It had me a lesson that bring extra fuel. Don’t count your chickens until they hatch. Oh dear. I was worn-out after that shocking tragedy. I took a deep breath and tried to get 10.000 rupiahs. Later, there was a mad woman sat close up to me. She asked me where I would go. I told her that I had took a wrong train and was at lost. After I had spilled my problem, she took something out from her wallet. A sheet of 20.000 rupiahs. She gave it to me. “You must go out from here or you will go through the worst night on a police station”, she remaked it. I was laughing a loud. I knew she was butting a bug in his ear. Thanks god. I found a beautiful angel on Sepanjang. Remembering of this tragedy, I sang an epic song from Tetty Kadi, Sepanjang Jalan Kenangan. Oh no. I had realized that made a mistake. I changed my playlist with a special hits from R5. It was turning out on my head when the driver picked me up to Bungurasih Bus Station. Adapted from my last post on Multiply and my first post on Kompasiana. but dari situ jadi punya cerita menarik yang bisa di share di Blog kan.
waduh, pak guru ikrom bisa salah naik kereta juga ya..
btw perempuannya pelit amat, cuma di kasih pas2an gitu 20ribu, oh iya lupa duitnya masih besisa 10ribu ya, hahaha. 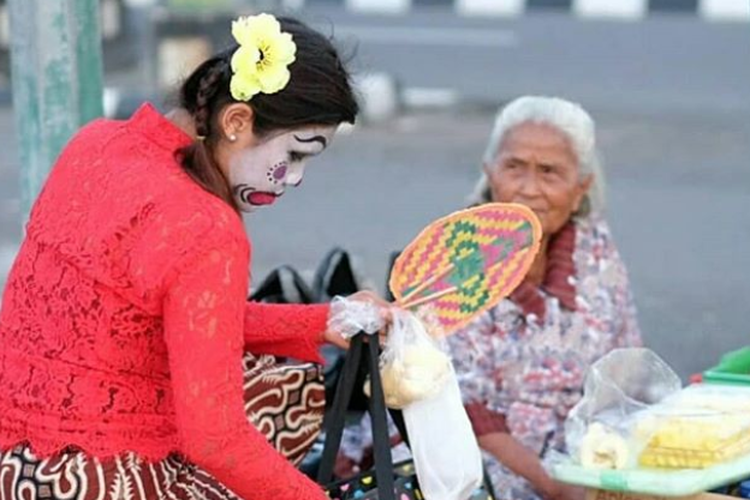 bawa sangu yang banyak kali-kali ketemu lagi eh ..
Tapi boleh juga tuh dicoba jalan-jalan nekat dengan kondisi uang minim gitu.